Butternut squash is a great fall and winter staple. There are so many things you can do with it, such as making a flavorful soup or just roasting it with your favorite spices. It is fairly low in calories and fat, full of potassium (great for blood pressure), vitamin a (good for vision) and fiber (can help get those sluggish bowels moving). Also, it does not spoil as quickly as some other veggies, so you don’t have to worry as much about it going bad before you have a chance to use it. The only thing that bothers me about butternut squash is cutting it up….I am not best with knives. However, I have found that poking some holes in it and putting it in the microwave a few minutes does help soften it up so it is easier to cut. You can then continue to cook however way you like after you have the squash slightly softened and cut up. I love little mini breads topped with deliciousness, so a few weeks ago I decided to make an appetizer that was a seasonal take on bruschetta. Instead of a tomato basil topping, I decided to make a kale and butternut squash topping. And I also added some goat cheese because cheese is delicious and of course adds a little calcium that most of us don’t get enough of. For my recipe I used Udi’s gluten free french baguettes but if you don’t need to make it gluten free you can always just use any other baguette type bread…preferably one that contains some whole grains. Preheat oven to 450 degrees. Slice baguettes into 1/2 inch slices after bringing frozen baguettes to room temperature. Brush 1 side of each piece with olive oil, using a pastry or silicone brush. Put slices oil side down on a parchment lined baking sheet. Cook for about 5 min on top rack of oven or until bread appears lightly toasted around edges. You may have to make in batches. Remove from oven and turn oven down to 400 degrees. 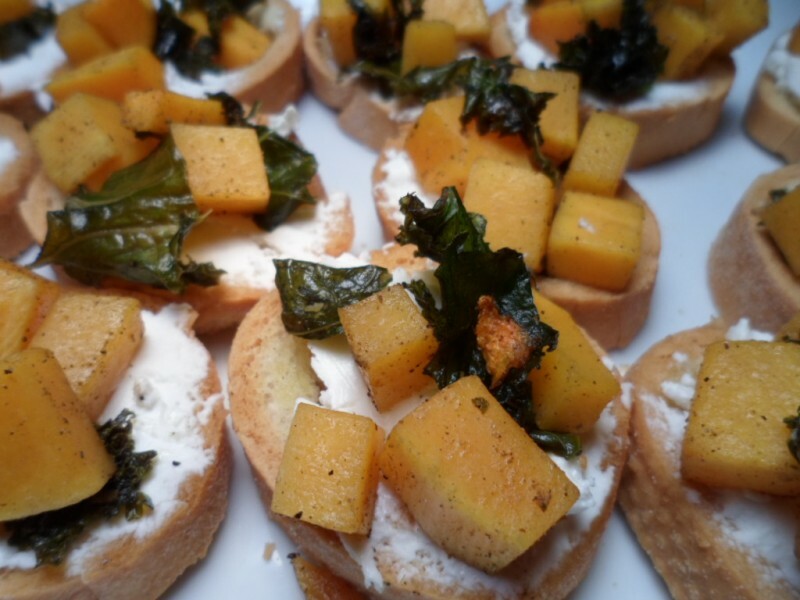 Add butternut squash and kale to a large glass baking dish. Mix in apple cider vinegar, 1 tablespoon olive oil, salt, pepper and sage. The kale may look like an excessive amount but it will bake down. Stir until evenly coated. Bake in oven for 35 minutes in lower rack or until butternut squash is cooked through (if you bake on top rack, kale may burn a little). 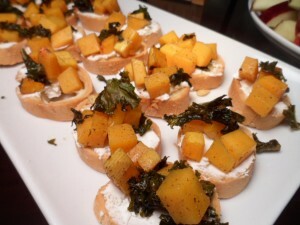 Top olive oil side of bread pieces with a thin layer of goat cheese and butternut squash mixture just prior to serving. December is here and I know many of you will be going to holiday parties so I thought this would be a perfect time to post an easy recipe that you could bring to a party or have at your own party if you are hosting. When going to a cocktail party or bringing a dish to someone’s home, I like to try and keep things as simple as possible. By that, I mean if I am hosting, I don’t like making a huge mess in the kitchen before people come over. Alternatively, when I am bringing a dish to someone’s home, I don’t want to have to worry about serving it with forks, plates etc. Cookies work out well for this and I know a lot of people like to bring and make cookies around the holidays, so if that is your preference check out my Whole Grain Buckwheat (or Oatmeal) Cookies. 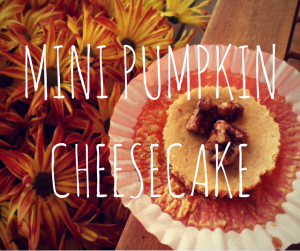 If you are interested in a different type of bite sized dessert, read on to hear about my Mini Pumpkin Cheesecakes…. Preheat oven to 325 degrees F and place rack in center of the oven. Place cupcake/muffin liners into cupcake tin and add 1 gingersnap cookie to each liner. Mix all remaining ingredients together with a mixer until smooth. 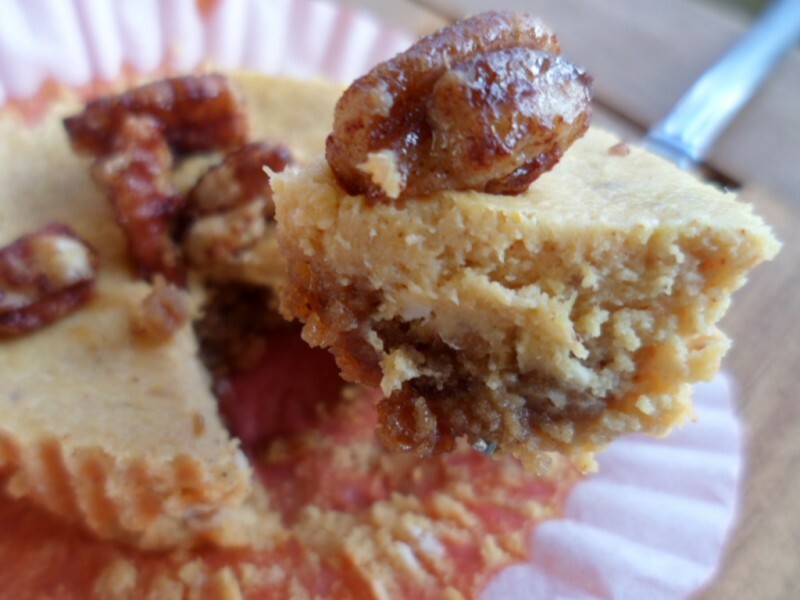 Add 2 teaspoons batter to each liner and bake in oven for ~20 minutes or until cheesecakes are firm in the center. Allow to cool and refrigerate until ready to serve. If desired, you can top with whipped cream immediately before serving or make a crunchy pecan topping. 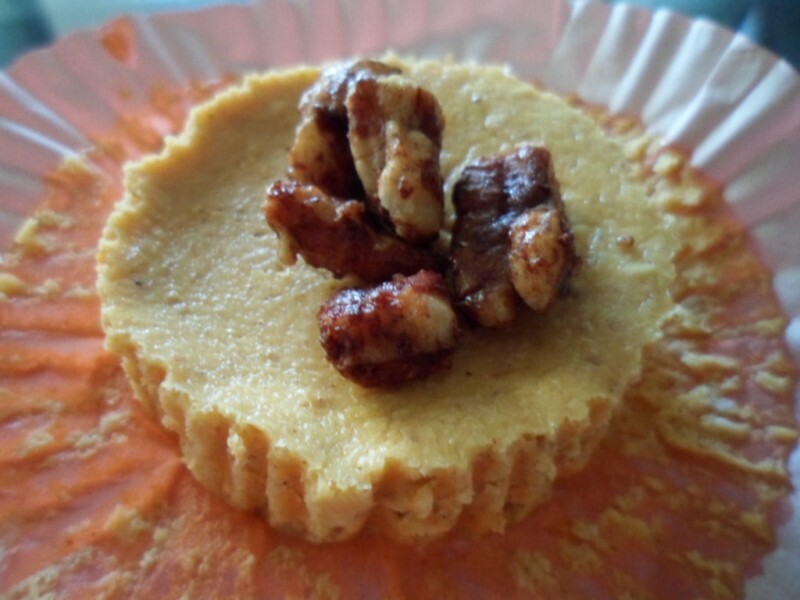 To make a pecan topping you can simply sauté a 1/2 cup chopped pecans with 2 teaspoons maple syrup and 1/2 teaspoon ground cinnamon over medium heat for approximately 2 minutes or until topping is warm and fragrant. Sprinkle a few pieces on the top of each mini cheesecake.